secondary scope was that of providing an atmosphere of adhesion to the principles of the new political ideology in which the future citizens would be formed. 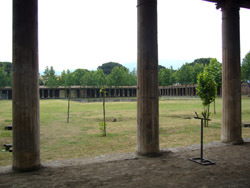 The palaestra of the ‘Iuventus Pompeiana’ occupies a vast area, 141 x 137 meter, and consists of a central space for gymnastic exercises, surrounded by a tall perimeter wall with ten monumental entrance gateways. Inside, on three sides, runs a portico of 118 columns in brick covered with stucco. Originally there were two rows of plane trees, of which the impression of the roots still exist. At the centre of the courtyard was a large swimming pool from one m. to two m. in depth. A room preceded by two columns off the south-west side, with the base for a statue near the back wall. This was probably the space dedicated to the cult of Augustus, patron of the ‘collegia’. A large latrine was on the southeast side. The Palaestra had been heavily damaged in the earthquake of A.D. 62 and was still being restored when the eruption of A.D. 79 took place.